Brad Pitt and Angelina Jolie were here before you. They fell in love with the beautiful village of Correns and bought a castle there (Château Miraval). If you prefer something a little smaller, we have the perfect townhouse for you. 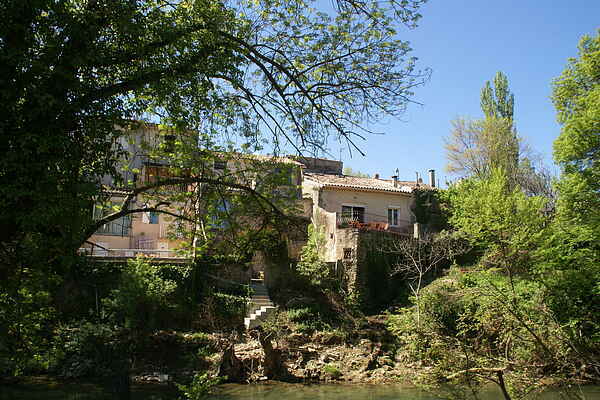 This townhouse is situated by the Argens, and on the terrace you have a wonderful view of this idyllic, meandering river. The interior is colorful and a little artistic here and there (beautiful fireplace). The bathroom is decorated with the famous colorful tiles of Salernes, and is very nicely done. The village of Correns is famous for being an organic village and the residents are very proud of their production of beautiful, organic wines. You can rent canoes here for a trip along the River Argens (from where you can see your holiday home from the water) or picnic on one of the many pebble beaches. For mountaineering lovers, the rocks in the valley of the Sourn (3 km) will present a fun challenge. Take a lovely stroll through picturesque villages such as Cotignac (13 km) and Tourtour (37 km). Culture lovers might like to visit the beautiful Cistercian Abbey in Le Thoronet (24 km).